News started trickling out late last year, then deadline.com reported that a new indie movie called Abilene was already in production (as of 9 December). Since then, a few more details have been mentioned in the media. So what do we know about this new movie? This indie movie features Luke Hemsworth as Wild Bill Hickok. It also stars Kris Kristofferson as George Knox, Trace Adkins as Phil Poe, Bruce Dern as Doc Rivers and Kaiwi Lyman-Mersereau playing John Wesley Hardin. 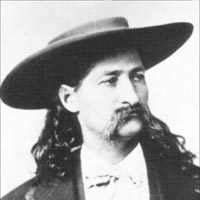 Setting: Wild Bill Hickok is known as the fastest draw in the West. The famous gunslinger heads for Abilene to track down an ex-ladyfriend. The wild living lawman gets drawn into local affairs during his visit. Abilene earned its name as Queen of the Cowtowns n 1867. It’s shipping point & stockyard caused rapid growth & prosperity. People of questionable character and temperament followed. Law abiding citizens were brought into contact & conflict with some very undesirable people like gamblers, confidence tricksters and anyone out to make or take money by any means. High-spirited cowboys looking to let off steam added to increasing levels of lawlessness & crime was rife. Thomas J “Bear River” Smith became Abilene’s first Chief of Police on 4 June 1870. He prohibited the carrying of firearms in the town by anyone without a permit to do so. Thomas Smith was well-respected, but sadly his career was cut short when he was cowardly murdered on 2 November 1870. His position was filled by Wild Bill Hickok on 15 April 1871. New railheads and the resolve of the residents ended Abilene’s wildest days. Abilene’s reign as Queen of the Cowtowns lasted around four years. Gunslinger (killed 3 men in a shootout in 1861) and known as the fastest draw in the West with his twin pistols. Legend says that he killed many more people in shootouts. Married a circus owner, Agnes Thatcher Lake on 5 March 1876 but left her a few months later. Sought his fortune in the goldfields and some legends say he became involved with Calamity Jane during this time. Murdered 2 August 1876 by Jack McCall who shot him in the back of his head while he was playing poker.